Eugene, Ore. – The USEF/AVA Vaulting National Championships were held from July 31 – August 3 at the Oregon Horse Center in Eugene. It was the first time that the National Championships were held in the Pacific Northwest and, at the highest levels, featured athletes that could be representing the U.S. at the Alltech FEI World Equestrian Games in Normandy (WEG) in just a few weeks. In the Individual Women’s Gold Division, Mary McCormick (Woodside, Calif.), top ranked Individual Female on the Short List for the 2014 Alltech FEI World Equestrian Games U.S. Vaulting Team, finished with a final score of 8.464 vaulting on Sydney Frankel’s Sir Charles and lunged by Carolyn Bland. McCormick earned the National Championship over Mary Garrett (Mountain View, Calif.) and Elizabeth Ioannou (Saratoga, Calif.), second and third on the Short List, respectively. Kristian Roberts (Moss Beach, Calif.), top ranked Individual Male on the Short List, narrowly won the Individual Men’s Gold Division with a 7.564, less than a tenth of a point better than second-place finisher Patrick Aaron Stevens (Martinez, Calif.), who finished with a 7.500 total. Roberts was also lunged by Bland and vaulted on Sir Charles. Third in the Individual Men’s Gold Division was Geoffrey Woolson (Tujunga, Calif.), who finished with a 7.002. The A Team Division went to the Woodside Vaulters Wizard of Oz team. Their stellar freestyle score of 8.323 earned them the win over the Mt. Eden Sun team in second place. The “Woodside of Oz” team is currently ranked number one on the WEG Short List. At the National Championships they vaulted on Julie Divita’s Pino del Rio and Woodside Vaulters’ Stanford and were lunged by Julie Divita. The Open Pas de Deux Division went to the team of Kristian Roberts and Mary Garrett with an 8.069 on Sir Charles, lunged by Bland. They are ranked second on the WEG Short List. 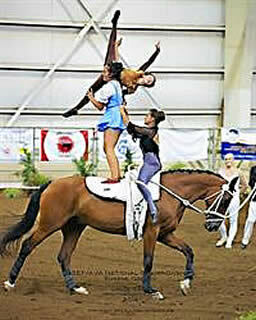 The top ranked Pas de Deux pair, Kimberly and Cassidy Palmer, did not compete. Silver Individual Female: Kristen Kuhn (San Mateo, Calif.) on Pepper Jack, owned by Woodside Vaulters and lunged by Krista Mack. Kristen is also a member of the Woodside A team (she is the scarecrow). B Team: Mt. Eden Vaulters, Saratoga, Calif.